New Delhi: Government of India, Ministry of Personnel, Public Grievances and Pensions (Department of Personnel & Training) has issued office memorendum regarding Implementation of recommendation of the Seventh Central Pay Commission on Dress Allowanceon on August 31, 2017. The undersigned is directed to state that in pursuance of the decisions taken by the Government on the recommendations of Seventh Central Pay Commission, and in supersession of the existing orders relating to admissibility of Uniform Allowance/Washing allowance/ Stitching Charges /Shoe allowance, etc to common categories of Group ‘C’ and erstwhile Group ‘D’ employees of various Ministries/Department's, including attached/ subordinate offices, who are supplied uniform and are required to wear them regularly, they shall be paid Dress Allowance at the rate of Rs. 5000/- per year. The Uniform Allowance/ Washing Allowance/ Stitching Charges / Shoe Allowance, etc. have been subsumed in Dress Allowance. The rate of Dress Allowance shall be, as mentioned in para-1 above, Rs.5000/- per year. The rate of Dress Allowance shall go up by 25% every time the Dearness Allowance rises by 50%. This order shall take effect from 1st July, 2017. 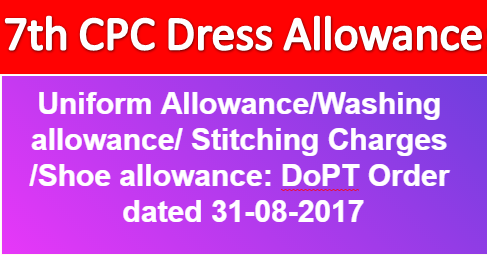 The rate of 7th CPC Dress Allowance shall be, as mentioned in para-1 above, Rs.5000/- per year. The rate of Dress Allowance shall go up by 25% every time the Dearness Allowance rises by 50%.